1. Any gathering of people or things; a collection. 3. A fitting together, as parts of a machine. 4. A work of art created by putting materials and objects together. 1. 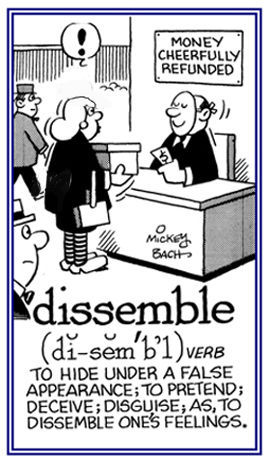 To bring or to call together into one place; such as, a group: The judge assembled the jury to present the verdict. The church will assemble again this Sunday evening. 2. To fit the parts or pieces of something together: Mark was assembling the data of his biology report to present to his university professor. 3. 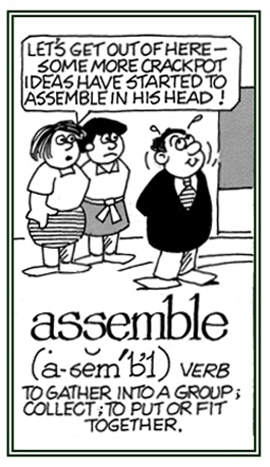 Etymology: from Old French assembler, from Latin assimulare, "to make like, to think like"; later "to gather together"; from ad-, "to" + simul, "together". © ALL rights are reserved. 1. A group of people gathered together, usually for a particular purpose, whether religious, political, educational, or social. 2. 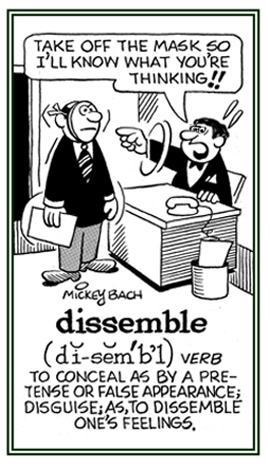 In government: a legislative body; especially, the lower house of the legislature in certain states of the U.S.: "The congressman presented a bill before the assembly." 3. In the military, a signal, as by drum or bugle, for troops to fall into ranks or otherwise to get organized, or the movement of forces, tanks, soldiers, etc., scattered by battle or battle drill, toward and into a small area. 4. The putting together of complex machinery; such as, airplanes, from interchangeable parts of standard dimensions. 5. A group of machine parts; especially, one forming a self-contained, independently mounted unit. An arrangement of machines and workers in a factory: "Mike works on an assembly line which has a moving track or belt, which allows a number of specialized operations that are performed in the productions of cars." 1. To integrate someone, or people, into another group so differences are minimized or eliminated: By studying the language of the country, the immigrants hoped to assimilate themselves into their new neighborhood. 2. 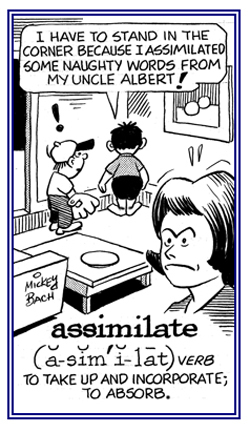 To conform or to adjust to the customs, attitudes, etc., of a group, nation, or the like: The new arrivals assimilated easily and quickly into their new culture. 3. To integrate new knowledge or information with what is already known or to incorporate and absorb into the mind: Jeremy is trying to assimilate the new information from his computer project so he can develop new programs for other people. 4. To incorporate digested food materials into the cells and tissues of the body: While Mildred was getting ready for bed, she was convinced that her nutritious dinner was being assimilated into her body so she would have energy for tomorrow's project at work. 5. 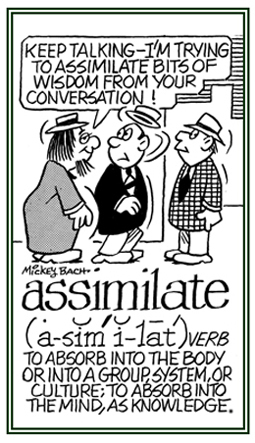 Etymology: from Latin assimilatus, assimilare, "to make like"; from ad-, "to" + simulare, "to make similar"; from similis, "like, resembling". © ALL rights are reserved. 1. The process of becoming part of, or more like, something greater. 2. The process in which one group takes on the cultural and other traits of a larger group. 3. The integration of new knowledge or information with what is already known. 4. The process of assimilating new ideas into an existing cognitive structure. 5. The incorporation of nutrients into the cells and tissues of plants and animals involving digestion, photosynthesis, and root absorption. 6. The changing of a speech sound under the influence of an adjacent sound. The practice or policy of encouraging the integration of people from all races and cultures: "At first the family from Iraq resisted the assimilationism of the United States." Tending to or causing an absorption or integration into something: "The doctor told Fern after her illness that she is now capable of absorbing food and other nutrients and incorporating them into her body tissues." Pertaining to the tendency or capacity to absorb liquids or energy.